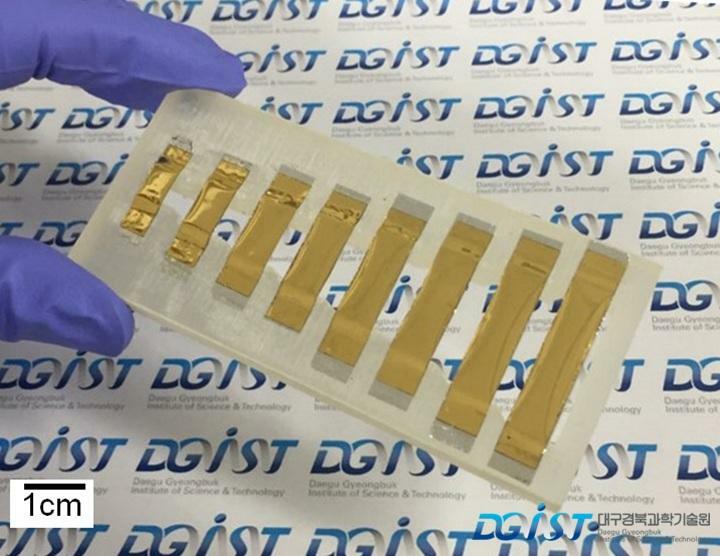 DGIST Professor Hongsoo Choi(Department of Robotics Engineering) and his research team developed the world's first artificial basilar membrane that mimics the cochlear function by application of the genetic principle of frictional electricity. The artificial basilar membrane is the crucial to overcome the limits of existing cochlear implant technology. The technology was co-developed by Professor Choi and Professor Jonghoon Chang(Ajou University Hospital). The team made the triboelectric-based artificial basilar membrane (TEABM), by applying the cochlear frequency separation and energy transformation functions, critical of the human hearing system, into the frictional electricity generated between polyimide film and aluminum film. In addition, they proved that TEABM made through animal experiments can be utilized for restoring the impaired animal's listening. Cochlear has a flexible basilar membrane in its inner side. The frequency of sound signals delivered through the external ear and the middle ear is mechanically separated by the basilar membrane's physical attributes. Furthermore, activity of basilar membrane moves the hair cell of cochlear and generates bioelectrical signals. While stimulating the neuron, the signals would be delivered into the brain for recognizing the sound. For a sensorineural-hearing loss patient, a severe hearing loss case, cochlear implant operation has been known as the only way to recover hearing. However, complication from exposure to the external body, a complicated electrical signal processing circuit, frequent battery charge, and expensive unit cost have been cited as major issues of the cochlear implant. In order to address the issues, Korean researchers already had developed artificial basilar membrane using piezo-electric materials. However, TEABM also is known to carry disadvantages such as relatively high frequency response range in comparison with human voice and low reception, complexity of piezo-electric materials and silicon based artificial basilar membranes production. Professor Choi's team applied Triboelectric Nanogenerator (TENG) using frictional electricity in producing of artificial basilar membrane. TENG transforms mechanical energy into electrical energy by using the electrostatic induction and triboelectric charges of two materials. The research team made the TEABM in order for the width and length of the beam to respond to the frequency of auditory scene by using the frictional electricity generated between polyimide and aluminum films. TEABM designed by the team could generate electrical signals, responding to the acoustic stimulation of fewer than 4kHz which is regarded as an auditory scene. TEABM then separated the frequency of acoustic signal mechanically and generated the auditory nerve for auditory nerve. In addition, the research team measured the Electrically Evoked Auditory Brainstem Response (eABR) of hearing impaired animals with generated electrical signals. The result showed that the operating frequency scene is close to the auditory scene and its receiving sensitivity is seven times higher, proving that TEABM will be used as the next generation cochlear implant's key technology for recovering hearing loss. Professor Choi said, "TEABM is a key technology viable to develop next generation cochlear implant not required for battery or a complex electrical signal process circuit. We will further make efforts for commercialization of technology in order for severe hearing loss patients. The research result was published on the cover of biomaterial international journal Advanced Healthcare Materials on October 12(Wed) 2016.